The mimids (a collective term which covers mockingbirds, thrashers, catbirds, and tremblers) are a group of New World oscine passerines with many common structural features. The relationships of this group to other passerine families has been the subject of some debate over the years. Originally they were considered to be closest to the thrushes, a family that breeds on every continent except Antarctica (indeed, Linnaeus, in 1758, put both the brown thrasher [Toxostoma rufum] and the northern mockingbird [Mimus polyglottos] in the same genus as the Eurasian blackbird [Turdus merula]); however, recent work based on DNA hybridization studies suggests that mimids are a sister-group to the starlings (Sturnidae), an exclusively Old World family. The geographic origin of the mimids is clearly New World, since they occur nowhere else, but exactly where in the Americas is less clear. The greatest diversity of breeding species of mimids is found in the southwestern United States and Mexico. South America, the continent richest in bird species, has only seven mimids, all rather similar members of the one genus Mimus, arguing for a relatively recent colonization with little time for widely divergent evolution into the dif ferent habitats found in South America. 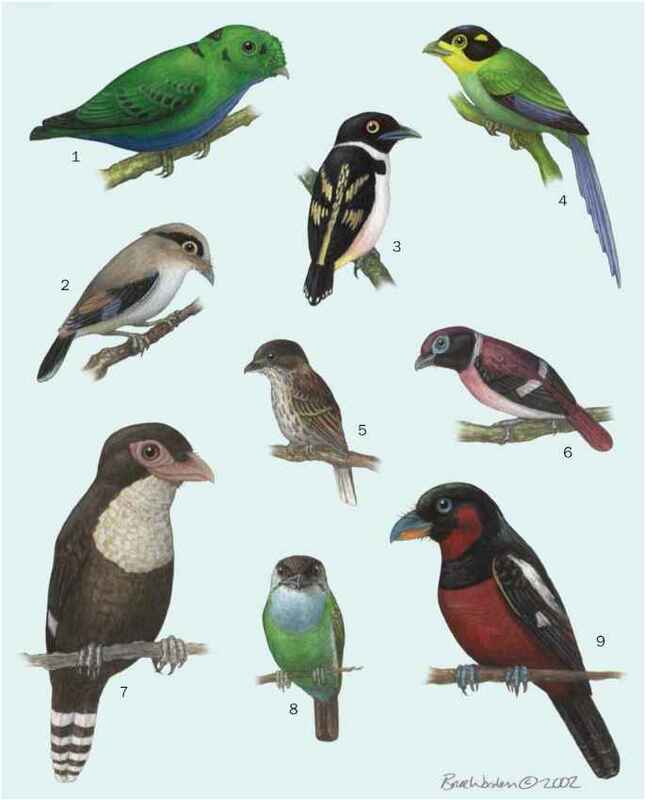 By contrast, the West Indies has eight species. Some have clearly been there for a substantial time, since they are members of three very diverse genera endemic to the region. Based purely on considerations of species abundance and diversity, an origin in Central America is argued for, with an early colonization of the West Indies and a later invasion of South America. This remains speculative in the absence of hard evidence, since the fossil record is unhelpful.